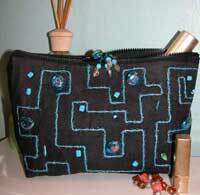 The Gigi Bag Pattern is great for makeup or sewing supplies! Instructions are given on how to couch (a template is included) and this is a fast project. Finished size is 12" x 6".